President Cho, Chun-koo of Sudokwon Landfill Site Management Corp. in an interview with NewsWorld said he will see to it that the landfill sites around the capital area will be among the most popular tourist sites in the world and will produce new and renewable energy from gas generated from the landfills, a remarkable development for a country that cannot extract a drop of oil from its soil. Immediate tasks for the company are to remove bad odors from the landfills on its way to making them popular tourism sites not only in Korea, but also in the world. The company will also continue with its plans to export its green technologies abroad with immediate target countries being Vietnam and China, having already exported them to Sichuan City in Sichuan Province, China. The company will also take advantage of the opening of the Gyeongin Ara Waterway linking Seoul and Incheon, the Incheon International Airport and the Incheon 2014 Asian Games to build sports facilities at the landfill sites. Question: What are some of the major plans to be undertaken by your company this year? Answer: We have chosen “Construction and Operation of Environmentally Friendly Landfill Sites and the Building of an Advanced Base for Green Growth with Energy and Resources Tools” as our major focus on the projects to be carried out by the company. In order to achieve the targets, we will do our best to remove bad odors at landfill sites to make them clean. We will build a public golf course, at the 1st Landfill to be completed this year in a bid to turn the landfill sites in the capital area into global environmental tourist sites. In detailed steps, the company will develop a core force for low-carbon, green growth in the area of landfill construction and turn them into global environmentally-friendly tourist sites. We also plan to strengthen our cooperation with neighboring areas by forging partnerships with them. Q: Please, can you be more specific in explaining the corporation’s major projects and the ways to achieve them? A: First, I would like to develop the landfill sites in the capital area as a core force for low-carbon, green growth. In a bid to build an environmental energy-integrated town in the capital area landfill sites we will continue to carry on with getting energy out of organic waste resources and inflammable waste resources and a CDM project to cope with climate change. I will see to it that the company will also support the development of environmental technologies both at home and abroad as part of its development of technologies for green growth and its support function. Second, we will promote the development and operation of global environmentally-friendly tourist sites. We will make various public relations and tourism contents as well as tours of the landfill sites in the capital area linked with the Gyeongin Ara Waterway in an effort to turn it into a famous global environmental tourist site brand when the canal is completed this September. Third, the company plans to make landfill sites environmentally friendly, concentrating all of its capacity behind the effort this year. The company will set up a committee made of government officials, resident community representatives and civil organizations to solve odor problems at landfill sites by fully discussing the issues and deciding on proper measures to remove all of the causes. Fourth, the company will strengthen its partnership with neighboring areas to carry out various projects including the construction of welfare towns, the creation of jobs for the residents in the neighboring areas, the building of sports facilities in landfill sites accessible to the residents and the operation of the Dream Park scholarship foundation to nurture talented youths and other diverse projects for the residents to lead the local development. Q: Last year your company got the largest carbon emission credit from the United Nations. What is its significance? A: The process to make landfill sites resources for the CDM project is to collect gas from waste material and supply it to a 50Mw power generation plant, which can be likened to killing three birds with one stone. It prevents bad odors from the landfill sites, produces new and renewable energy and it also reduces greenhouse gas emissions, a representative low-carbon, green-growth engine. The carbon emission credit is based on the CO2 reduction from April 30, 2007, the registration date, and Nov. 30, 2007, seven months later, which came three years after the registration of the CDM project and will be used to develop the CDM project and the environment industry overseas to be undertaken by the company. The first carbon emission credit of 394,672 tons of CO2 are equivalent to the annual exhaust fumes from 170,000 cars. Q: At the end of last year, for the first time in Korea, your company reaped overseas operation results. What was the significance of the feat? A: The landfill sites in the capital area were considered to be on a global scale in the OECD environmental analytical report made in 2006. It said its scale was the largest in the world at that time and the best managed. The technological know-how for turning the landfill gas into resources was exported to China’s environment market. On Dec. 28, 2010, the Ministry of Environment, the Korean consortium and officials of Sichuan Province and Sichuan City held a ceremony to “start the CDM Project for Jangan Landfill Sites Gasification”. 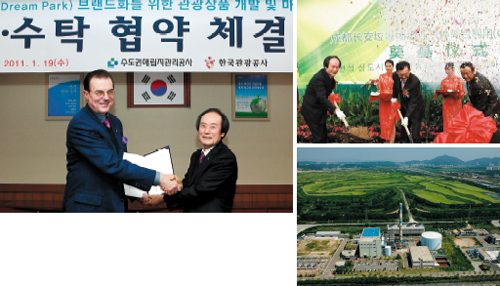 The Korean Consortium led by the Sudokwon Landfill Site Management Corp., Retech Solution, Hanyang Engineering and Korea Development Bank invested 20 billion won in the project and expect to earn 130 billion won from the management of the project in 12 years of operation. The company dispatched a number of professionals to help them expand the landfill projects to other areas and cities in the province and the company also plans to export the technologies to Vietnam soon. Q: What are some of your plans to make the landfill sites international tourist site brands? A: Most of all, the company first plans to complete the recovery of the environment on the 1st landfill site by building a Dream Park and taking maximum advantage of such landmark facilities in the capital area as the Gyeongin Ara Waterway, which will be completed this year, and the Incheon International Airport. It will also invite the projects to build golf courses, swimming arena and horseback riding courses on the Sudokwon landfill sites. The profits from the projects will be used in the projects to make the landfill sites global environmental tourist sites. The company signed a cooperative tie-up with the Korea Tourism Organization (KTO) in January on such matters as the construction of the facility to energize the gas from landfill sites, a new and renewable energy town, a botanical garden, a wildflower garden and the 2014 Asian Games Stadium. Under the agreement, KTO will develop various tourism products such as eco-tours and conduct marketing and public relations campaigns to make the facilities known around the world. Q: How do you plan to strengthen the management of landfill sites? A: Odors from landfill sites are no longer a problem that can be ignored and must be taken care of as soon as possible. Many changes are expected to occur around the landfill sites this year as the Gyeongin Ara Waterway is scheduled to open in September, the construction of 2014 Asian Games Stadium and a large apartment complex, among others. The elimination of odor is a “must do” task for the company, which is striving to make the landfill sites as world-renowned tourist sites. Thus, we are about to declare a war on the elimination of bad smells in the landfill sites and will set up regional councils where landfill sites are located and solve the problems by finding out the causes and measures to solve them. In detail, the company will continue to make investments in facilities and R&D activities to snuff out bad odors from landfill sites and let the regional councils take care of the problems one by one. Q: Do you have anything that you want to say to our readers? A: Our company has gone a step up from just burying wastes into landfills to treat them environmentally friendly and has now been striving to generate energy from them and make them into popular world environmental tourist sites by building a Dream Park on them. (Clockwise) President Cho Chun-koo of Sudokwon Landfill Site Management Corp., right, shakes hands with President Lee Cham of Korea Tourism Organization after signing an MOU on Jan. 19 to promote the Dream Park brand tourist sites inside the landfill sites at home and abroad. ; President Cho and local Chinese officials participate in a ground-breaking ceremony on Dec.28, 2010 for the Jangan Landfill Sites Gasification plant to be built by the Korean consortium led by Sudokwon Landfill Sites Management Corp. and Korea Development Bank, among others. ; A thermal power plant model projected to be built inside landfill sites.